The web site Twenty Nine Inches (www.twentynineinches.com) has become one of the most trusted sources for independent reviews and opinions on 29er mountain bikes and related products. In their recent year-end wrap-ups, two bikes by Century Cycles top bike brands took #1 honors, in "Readers' Choice Award" and "Top 10 29er Products of 2011." The Giant Anthem X 29er won the Readers' Choice Award, coming out ahead of a range of other products, including such heavy-hitters as the Specialized Epic S-Works 29er. Readers praised the bike as "a great all-rounder for XC, Trail, and backcountry adventures." Others praised the light weight and called it "Simply the best bike ever. Comfy, fast, agile." You can check out the 2012 Giant Anthem X 29er 1, currently in stock in a size Medium at the Century Cycles store in Medina. It features a SRAM X.9/X.7 drivetrain, Avid Elixir 5 hydraulic disc brakes, Fox front and rear suspension, and Schwalbe Racing Ralph Evo tires. 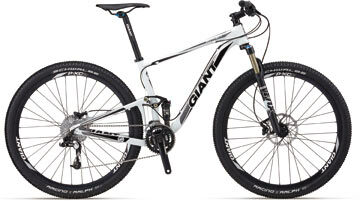 We've also got the 2012 Giant Anthem X 29er 2 in stock in Medium, Large (Medina), and Small (Rocky River). It features the same lightweight Giant ALUXX aluminum frame as the Anthem X 29er 1, with Giant's patented Maestro full suspension design, SRAM X.7/X.5 drivetrain, Avid Elixir 1 hydraulic disc brakes, RockShox suspension, and the same Schwalbe tires. Taking top honors as the Top 10 29er Product of 2011, the 2012 Raleigh Talus 29 Carbon Pro is "no slouch in the spec department," with a SRAM X.0 drivetrain and hydraulic disc brakes, Easton carbon wheels, Easton carbon handlebar, Fox suspension fork, and Geax AKA tires. Guitar Ted, the well-known founder of the Twenty Nine Inches site, like the bike's handling the most, saying "...they have nailed it...It handles with stability and ease, which one would appreciate on any long off-road outing, but yet it goes up, and can pick its way around stuff with no real fuss." Unfortunately, Raleigh produced the 2012 Talus 29 Carbon Pro in limited quantities, and all that were made are already spoken for. However, you can order it as a frame-only (Raleigh's lightweight DirectConnect carbon with Kevlar reinforcement, internal cable routing, and press-fit bottom bracket), or get a bike with the same frame by ordering the 2012 Raleigh Talus 29 Carbon Elite, featuring Shimano Deore drivetrain, Shimano M505 hydraulic disc brakes, and Fox suspension fork. If you're looking for a 29er hardtail on a budget, you can come check out Raleigh's entry-level ($649.99) 2012 Talus 29, in stock in Medium and Large in Peninsula and Rocky River. It features Raleigh's Atomic 13 butted aluminum frame, Shimano Acera drivetrain, and Hayes mechanical disc brakes. 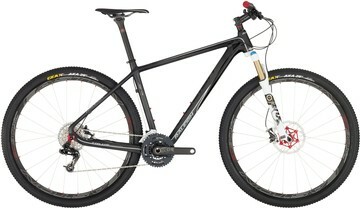 At the same price is Giant's 2012 Talon 29er 2, with a SRAM X.4 drivetrain and Tektro mechanical disc brakes. In stock in Small (Peninsula) and Medium (all three stores). As always, call us to verify availability before stopping in!